Nishiguchi We are Quark Shinsaibashi shop in Kansai area. Our shop has been supremely favored by customers since we found in 2000. Gratefully appreciating all customers that it is not only Japanese but also foreigners use our shop to purchase watches. New, pre-owned, vintage..We handle various watches and so many stocks. It is not only Rolex but also other brands（PATEK PHILIPPE・CARTIER・OMEGA・PANERAI・AUDEMARS PIGUET・・・etc.）we handle. You must be enjoying to choose watches you suit. Our staff always serves you with smiles, so please feel free to ask us. 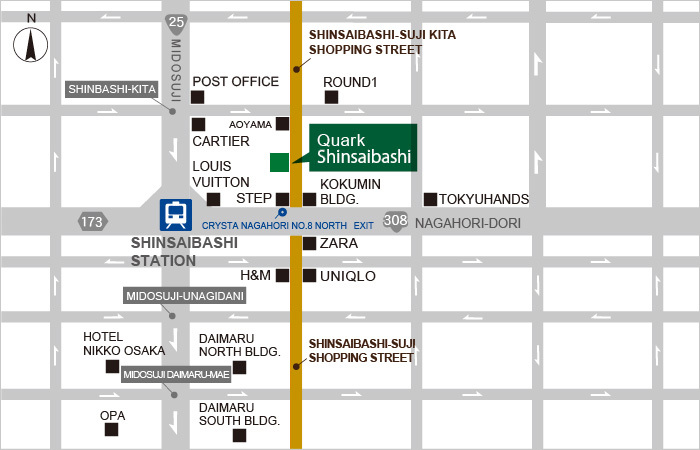 Location is the middle of downtown in Osaka, you can enjoy going shopping at brand shops, drug shops surrounding there. We are happy you drop by our shop when you visit to Shinsaibashi. We would appreciate if you would come to.